Break free from the shore. Trade the well-worn path for a waterway. Step out of your routine and onto a pedalboard. The Mirage Eclipse gives you the stability, control and power to chart your own course. The water is waiting. You in? *$500 discount applies to purchases made from Hobie dealers in North America only. Find balance: Wind, waves, and wake? No worries. 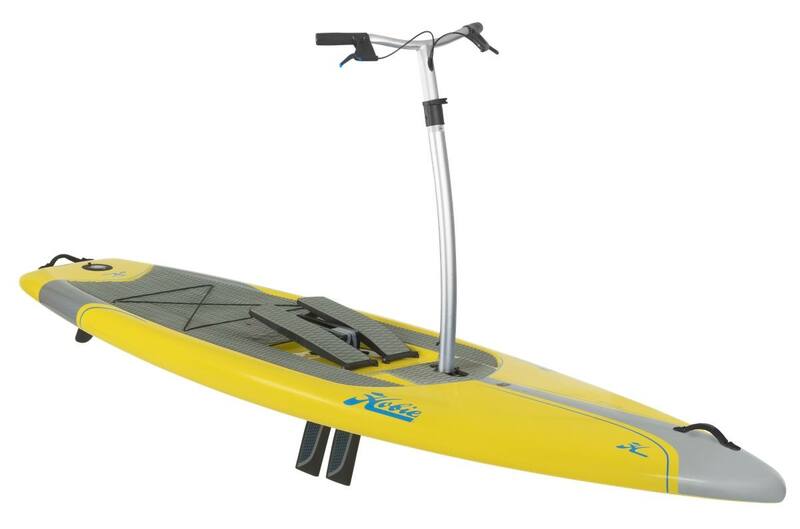 It's wider than a paddleboard and its hull and handlebars are optimized for stability. Get ready for an extra-balanced ride. Keep it easy: The Mirage Eclipse goes right from your car, dock, or boat to the water. A removable handlebar and rudder means you can take this nearly anywhere. Choose your crew: Ride solo or take a pair of Eclipses out. Join forces with a standard SUP-er or kayaker. Got a furry friend? Bring em' along for the ride. Make it yours: Add a Hobie H-Crate to hold your fishing poles, a Standard Cart, or Trax Cart to make transport a breeze. The Mirage Eclipse fits in with the full Hobie lineup.